The amount of Swedish players that have made a impact in the NHL have greatly increased the past 15 years. Now Sweden are the third most common nationality with more than twice as many players as Finland, which is the fifth most common country. Every season there are great Swedish players available in the draft. And if you don’t want to rely on that you can trade for a Swedish player that can score the Stanley Cup winning goal against the team you got him from. Today we are going to go through a couple of different kind of prospects. Some are going to be guys you can expect to go in the first round, while others might go a bit under the radar. I’ll first go through the top prospects, and then in the bottom you will find those who could be hidden gems. D, Timothy Liljegren, Rögle BK (SHL): The trend these days is to find a good puck moving defensemen. Liljegren is just that. Before the 16/17 season he was ranked as high as top 3 by many scouts, but after a shaky season he is finding himself in a spot where many scouts are torn. Some say he will still go top 10, and some say he will be a late first round pick. The upside on Liljegren is huge, but there is some concern about his game that may make some teams hesitate about taking him top 10. As a 16-year old he made his debut in the SHL, which isn’t something you see everyday. He played 19 games and had 5 points, not a bad record for a rookie defensemen in SHL. However, in his second year he had the exact same stats in the exact same amount of games. And with the hype that came with his first year many were disappointed with his performance. So, will he bounce back next season? That’s the question a team have to ask themselves before picking him high in the draft. 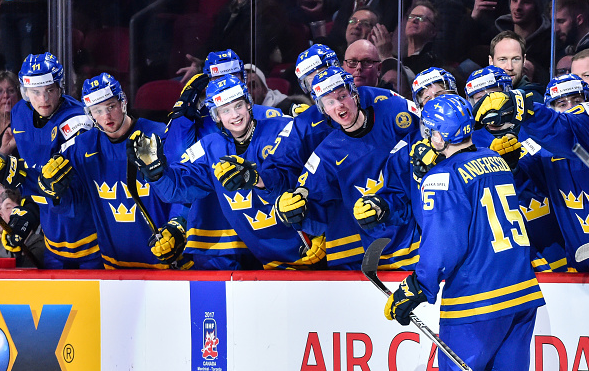 FW, Lias Andersson, HV71 (SHL): Andersson had a really big breakout season with HV71, a very deep team that made it all the way to the cup. In the 15/16 season he had 0 points in 22 games, and this season he had 19 points in 42 games. With that he was the best junior player in the SHL. Andersson has great offensive abilities and can create offence on his own and doesn’t have to rely on others to make the work for him. He also have a good shot and can snipe the puck if he gets the opportunity. D, Erik Brännström, HV71 (SHL): Here is your pick if you want a solid defensemen that have the potential to also put up some points. Brännström played 35 games in the SHL this season and put up 6 points, he only averaged 12 minutes per game though. In the Swedish U20 league he showed us his offensive potential. He put up 9 goals and 23 points in only 19 games. With that he was the defensemen with the best PPG. Brännström would be a great pickup for a team that is looking for a reliable defensemen to build around. It might take a couple of years though until he becomes that, but the potential is clearly there. FW, Elias Pettersson, Timrå (Allsvenskan): Pettersson played this season in the Swedish second league. He scored 19 goals and 41 points in 43 games, which made him one of the top scorers in the league. Petterson is a two way forward that is very consistent with his play. He doesn’t hit slumps very often and can be a player that you rely on to put up points game after game. The only question mark with Pettersson is that he played in Allsvenskan, and will play in SHL next season. But, as a comparison you can look at Nashville’s Filip Forsberg‘s numbers the year he was drafted. Forsberg also played in Allsvenskan, and put up 17 points in 43 games. Pettersson will probably be one of the Swedish players that goes first in the draft because of his offensive talent. Now, let’s dive into the more unknown players from Sweden. There is a lot of talents that will go in the last six rounds of the draft, and I can’t go through them all. However, I will go through some players that I think can be late round steals. G, Olle Eriksson-Ek, Färjestad (U20): If you recognize that name? That’s probably because his brother plays for the Minnesota Wild. Eriksson Ek is a goalie that have been seen as one of the biggest goalie talents of his class in Sweden. As a underaged goalie in a mediocre team he was among the top goalies in the league with .924% and 2.16 GAA. He will need some time to develop before he is ready for a shot in NHL, but if a team wants to take a chance on someone who can be a goalie in a few years when their current goalie is older, then this might be your pick. Maybe the Minnesota Wild will take a chance to get the two Eriksson Ek brothers on the same team. Relax Wild fans, they are not as similar as the Sedin twins, so you can tell them apart. FW, Lucas Elvenes, Rögle BK (U20): This one might take a couple of years to get to the NHL. However, Elvenes has always showed us that he can put up great numbesr at whatever level he plays at. The downside with Elvenes is that he haven’t played much in SHL yet, so we don’t know if he can elevate his game to the next level than men plays at. He will get the chance next season though as he will be loaned out to Oskarshamn in Allsvenskan. So this one might be a bit of a wildcard, but with a late round pick that would probably be worth it for a team that needs a scoring winger. FW, Fabian Zetterlund, Färjestad (U20): This might become one of the biggest steals of the draft. Zetterlund is a very offensively talented player, but needs to work on his overall game to be able to get to the next level. He have a great release and can also play the puck really well. He hasn’t gotten a real shot in the SHL yet though. He just averaged three minutes per game in 14 games this season. His style of play is similar to Alexander Ovechkin, and if he can develop his game enough to take a spot in the NHL he will most likely do it as a sniper that will put up a lot of points. For Zetterlund it seems like there is no middle ground, he either scores on the next level, or he doesn’t get there at all. He is one of the most exciting prospects to follow in this draft.